It is said variety is the spice of life, and if that is the case, then Cobblers supporters can look forward to a tasty season in Sky Bet League One. It has been a busy, busy summer of comings and goings at Sixfields, with plenty of the old guard being moved on. That was something that caused concern early on in the close season, with player of the year Zander Diamond being allowed to leave, along with goalkeeper Adam Smith and defender Gaby Zakuani - all key players as the team secured its league one future following the previous season’s title winning-campaign. Others were also shown the door, which meant the Sixfields cupboard was pretty bare for a while. Now the cupboard doors can barely be closed for first team squad players! 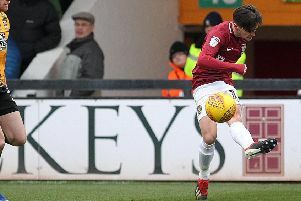 Boosted by financial muscle following the surprise investment from Chinese company 5USport, Cobblers boss Justin Edinburgh has gone out and hand-picked the players he wants to make his team competitive in league one. The squad looks very, very strong, with at least two players vying for every oufield position. And the players all have different strengths too, different attributes. They is a real physical presence to the squad now, real height, there is genuine pace, there is energy, there is guile. There is youth and experience, and it all means that the Town manager is going to have plenty of options when it comes to who he plays, and how he plays. Which is exaclty what he wanted. “What we have strived to put together is a squad with options, and what I want going forward, and what the players need, is healthy competition,” said Edinburgh, who admitted he was disappointed by the lack of depth in the squad when took over from the sacked Rob Page in January. “I don’t want fear, but I want a competition where the players know they need to be performing week in, week out. “I didn’t have that last season, but I certainly feel we have it in abundance this year. Not only has Edinburgh gone out and brought in players of proven quality at league one level and above, he has also been careful to ensure those players possess the right character. And Edinburgh admits how the players are in the changing room, is almost as important as how good they are out on the pitch. Particulatly as there are going to be plenty of them disappointed each week if they don’t make the match day squad. “Every player we sign, permanently or on loan, you try to get to learn a little bit more about them, and character is key,” said the Cobblers boss. “Any success is built on team spirit, and the dressing room being right, and I have felt that from day one when we went to Spain (for the pre-season training camp). “I felt the chemistry and the dynamics within the group were really positive, and that has continued with the players we have added. “There will be some disappointment, and I wouldn’t want it any other way, but I don’t envisage there will be anyone pulling in a different direction other than being supportive and wanting us to be successful. “That’s whether they are in the 18, or outside of that.